We’ll be taking a Christmas break from the blog, but before we go, Paul shares some holiday memories. I’ve never fallen out of love with Christmas. I’m thankful for that. Somehow the madness of the holiday season – the crowded malls, the in-your-face commercialism, the social occasions with relatives you can’t stand – have all passed me by. My personal Christmas is still infused with the memories of more than fifty years ago. The smallish city I lived in then was blanketed in peace and tranquility on Christmas morning, with ghosts of solitary tire tracks on snow-covered lanes. To this day, some of my favourite seasonal music were the songs I first heard on an old Columbia Masterworks 10-inch Christmas LP – sounds that came out of hiding every December to evoke the holidays season: “Patapan”, “Gloucestershire Wassail”, “Sing we Noel once more”, and others one hears too rarely these days. 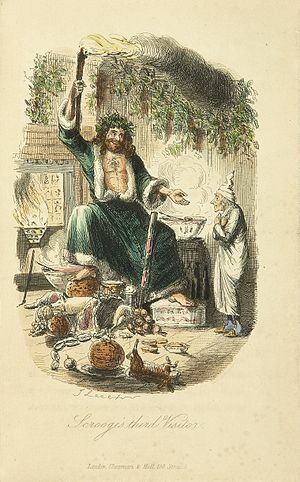 The music was similar to that which played on my favourite Christmas movie – then and now – the black-and-white version of “A Christmas Carol” with Alastair Sim. For a few glorious years in my childhood, the family assembled at least thirty five members from cousins to great aunts and uncles for a dozen hours of feasting and games. Not willing to choose between the English tradition of ham and plum pudding, and the North American tradition of turkey and trifle, the family did both – one meal at one house, then everyone heading over to a second home for the other tradition. Now perhaps as young children, my siblings, cousins, and I were protected from harsh realities such as family feuds. But I doubt it. I really believe that all thirty five of us were happy to be there, and everyone got along. We were a family that truly enjoyed each other’s company, playing games, singing songs, and generally being jolly until the night overtook us. Somehow I’ve been able to carry that sense of Christmas peace and love and family with me for half a dozen decades, despite the many changes the years have wrought. The grandparents, great aunts and great uncles are long ago departed – most of the parents, aunts and uncles too. Cousins and siblings have scattered far and wide. The city has grown substantially and no longer shuts down completely for a couple of days in late December. All the older photos were destroyed in a flood. At this time, the gathering was under a dozen. I think my secret has been to keep the spirit and not fret the form. A few years ago, when we were still buying a few Christmas presents for close family, I made a decision that I would henceforth avoid the box stores, malls and traffic jams. I would eschew the best bargains for presents bought in the spirit of Christmas. I would choose a quiet area of town, where stores were walkable, and do my shopping on foot at a leisurely pace, and without really knowing what I’d find. I’d stroll the relatively quiet streets, chatting to shopkeepers, and seeing what caught my eye. I always found what I needed. While others all around me were complaining of crowds and Christmas commercialization, I felt the same inner peace I’d felt in my childhood. Not many years later, I noticed that Cheryl was finding Christmas more stressful. Despite pacts with parents and siblings to eliminate gift exchanges, as our kids were growing up, it seemed as if old rituals were evolving into new obligations. Holiday parties were becoming impositions, and even shopping for Christmas meals seemed to involve fighting crowds and traffic. So we made a further pact with our two sons that we’d skip the presents altogether and put the money towards a Christmas holiday in Hawaii or some other tropical destination. As it turned out, Cheryl’s Mom chipped in generously on more than one occasion, and we’ve enjoyed several low-stress extended-family tropical Christmases in recent years. 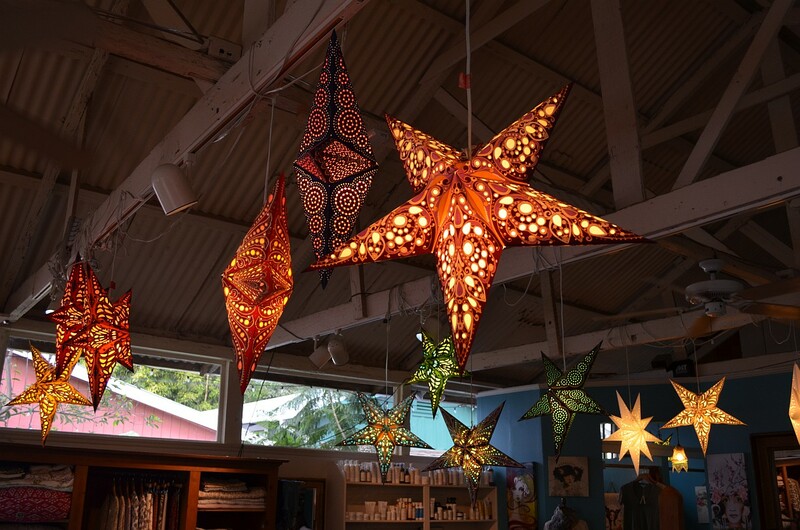 Christmas in Hawaii: stars in the gift shop. More recently we’ve had to adapt to new realities. Changes in family dynamics mean that getting everyone together on Christmas Day is rarely possible. Both of my siblings are now grandparents, and the grand-kids may be claimed for the day by other families, taking their grandparents with them. One or the other of our boys may be invited to Christmas dinner with their girlfriend’s family. So, we roll with the punches. Some years the day itself is a quiet one – this year, for instance, we may be on our own and spend the evening taking in the light displays in the neighbourhood. Our family Christmas dinner may be on the 24th. Still, new traditions are forming. In some recent years, we’ve held a variant of the “widows and orphans” party on the 26th – we’ve invited friends and acquaintances who perhaps have no relatives nearby, and who we think might enjoy the sort of fun, songs, and games my family used to enjoy over half a century ago. This year we’ve invited about fifteen from a variety of backgrounds – we’re hoping to play Murder, a game we learned from one the recent immigrants I’ve been assisting, and who’ll be joining us that day. Like our childhood games, this one requires no purchases and no supplies beyond a few pencils and scraps of paper – only a willingness to slow down and enjoy the family atmosphere. It doesn’t take much to enjoy Christmas. Will things change again? No doubt they will. The arrival of grandchildren – not yet on the horizon – will herald another major shift. Gift-buying may once again be part of Christmas for us. The “peace” of Christmas may only be found after the little ones fall asleep on the couch. One day we may be celebrating Christmas in a retirement commune. I have one other dream – a bucket-list promise to take Cheryl to a small village in the Alps for a traditional Austrian Christmas. Thinking back over the years, I can remember many other sorts of Christmases. Gatherings with family friends where my father would sing – the only time of the year I ever heard that. A decade later, it was tobogganing with friends down the hill behind our country home.. Ten years after that, Cheryl and I were living in Australia and passed several Christmases on the beach under a blistering sun. One year, while camping at Byron Bay, NSW, a Christmas-eve flash flood left us drying everything on tree branches the following day, while we barbecued crabs and sucked on fresh mangoes. 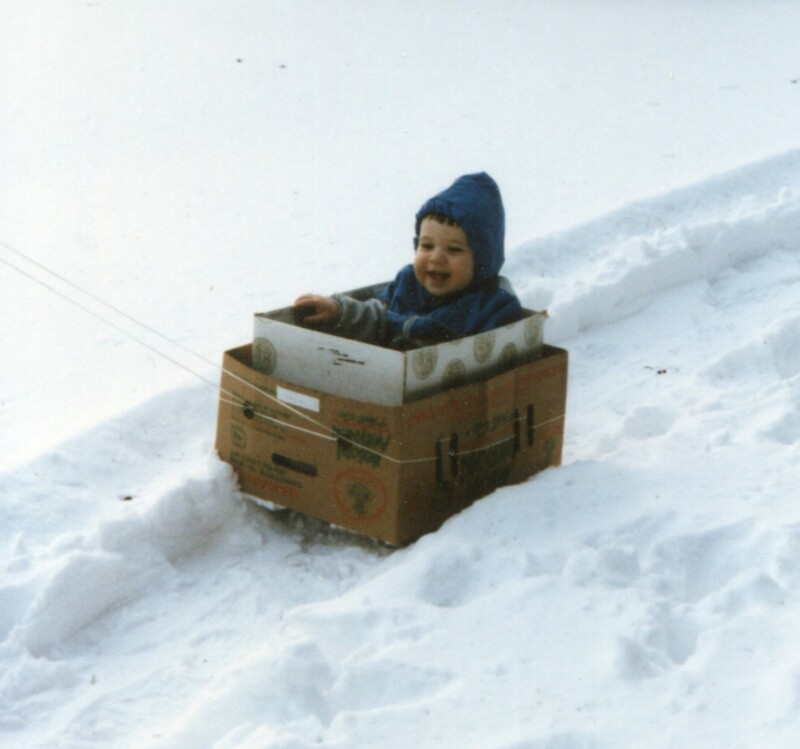 A few years later we were snowed in for days at my parents’ hilltop home, periodically hiking down the hill for supplies. There was one low-key Christmas in Costa Rica. More recently, I joined a Christmas choir one winter to sing at the light show at the botanical gardens. And so it goes. The same theme runs through them all: a sense of peace, and love, and family – externally shaped by the conditions of the day, internally unaffected by the ebb and flow of life. If I have any trouble getting into the Christmas spirit, I have only to play an old musical favourite like Patapan, and my heart once more fills with all those wonderful Christmas gatherings of family and friends. Have a peaceful holiday season, both inside and out. See you next year! Keep the Magic Close to Your Heart….. This entry was posted in Community and tagged Christmas, Christmas Carol, December, Family, Friends, Holidays, New People, Peace, Traditions, Wassail on December 18, 2013 by "No Pension, Will Travel!" with Cheryl + Paul. Paul, you are one of those rare individuals who appreciates Christmas for what it is. I love Christmas and all the traditions but do get caught up in the craziness of it sometimes. 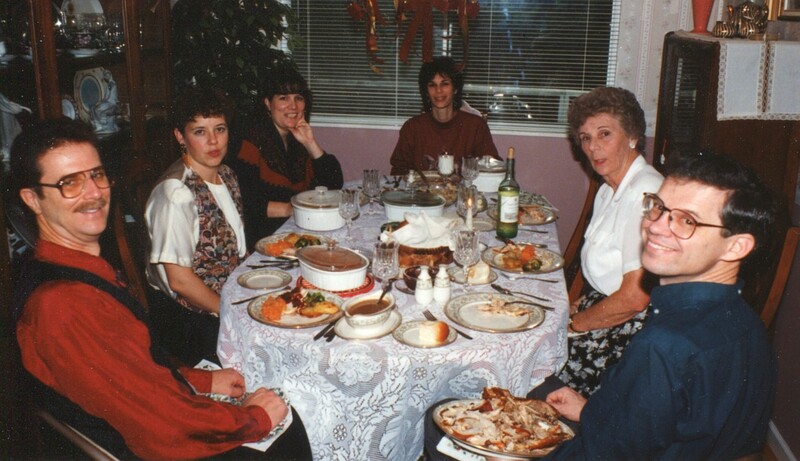 I too remember the big.family dinners when my grandparents were around. We always had so much fun playing board and card games after the meal. No TV then. It will be a quiet one for us this year and part of me is sad but the other part is looking forward to it. Thanks, Darlene. I think my own grandparents and their family were a big part of it. They always knew how to have a good time, and stayed young at heart all their lives. They could play the silliest of games, but my grandmother and her three siblings could also mount a passable chamber ensemble to play some Bach together if the spirit moved them. They seemed to have raised a family that enjoyed each other’s company their entire life, and often included others as part of that family without skipping a beat. Here’s to family and friends this Season however we find them. Merry Christmas! Thank you for this! I too remember wonderful Christmases past and agree that it is the people and the love that matter, not the gifts. I love it that you, too, think that the Sim (1951) version of the Christmas Carol is the best–it’s my favorite. PS. A few years ago, a client of mine, who is also a Sim-version fan, invited me to participate in a recreation of a scene from that film – the one where Mrs. Dilber comes in and finds Scrooge near out of his head. We were to perform it at her staff Christmas party. Unfortunately, illness intervened, and we never did. I must dust off that script. (I had to transcribe it from the film, as the scene doesn’t appear in the Dickens original.) It has the following in it. I don’t know what day of the month it is. I don’t know how long I’ve been amongst the Spirits. I don’t know anything. I never did know anything. [starts laughing] But now I KNOW that I don’t know anything! [singing & dancing around] I don’t know anything, I never did know anything, but now I know that I don’t know, all on Christmas morning! Ahhhhh, Paul, you’ve really captured the essence of Christmas for me! I resonated with every image. And, in keeping with the situation, and the comments above, I am compelled to add that the Sims Christmas Carol is my loooooooooonnnnnnng-time favourite. We still watch it every other year or so. And the scene where Scrooge comes to LIFE in the morning, well, that’s truly a Christmas gift. Can’t wait to see the performance. I may have to find a stand-in for Mrs. Dilbert. How’s your Dickens? Happy New Year!